Your Galaxy Tab doesn’t come with Skype software preinstalled. To get Skype, saunter on over to the Android Market and download the app. Read through the initial, informational screens. You can’t make emergency calls using Skype. Type in your account name and password. You may be asked to accept the terms of agreement; do so. There may be a tour presented that previews how Skype works. Feel free to skip the tour. One of the biggest questions you’re asked when you first run the Skype app on your Galaxy Tab is whether you want to synchronize your contacts. To quickly import your contacts, choose the preset option, Sync With Existing Contacts. Touch the Continue button. The Contacts button on the main Skype screen lists people and phone numbers you’ve connected with on Skype. 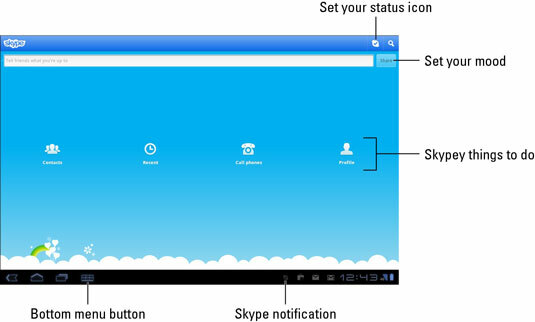 Touch the Profile button on the Skype app’s main screen. You’re prompted to sign back in to Skype the next time you run the app. To quickly access Skype, touch the Skype notification, shown in the margin. You can make calls to phones on Skype only when you’ve added Skype Credit to your account.